So with a new month comes new events and ARU Classes! Here is the list of events that we are hosting this month! Fishing @ 1 PM SLT on August 1st! 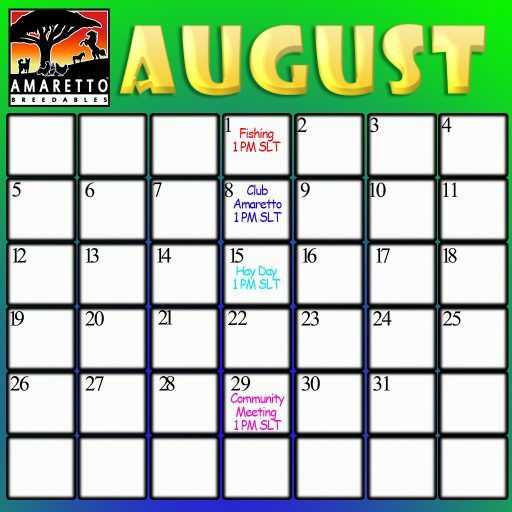 Club Amaretto @ 1 PM SLT on August 8th! Hay Day @ 1 PM SLT on August 15th! Community Meeting @ 1 PM SLT on August 20th! You know what happens at the end of the month dont you? Its Amarettos Birthday! We always have an awesome party and lots of fun! I am already looking forward to it! I hope that if you haven’t attended all the ARU classes go check some out they aren’t very long and are very informative! 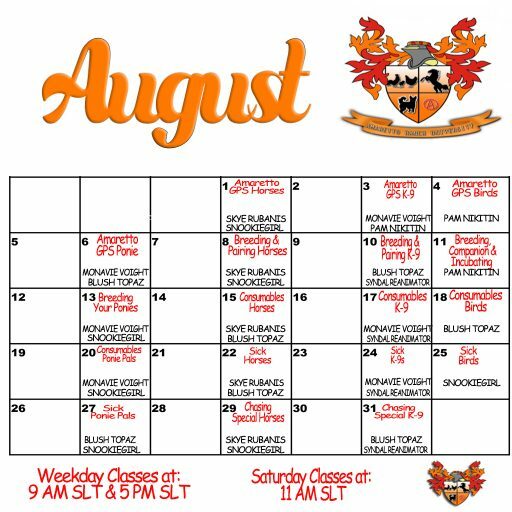 Here is the month of August classes available! I hope to see you guys out and about in the next month! Happy breeding Everyone! This is Ava over and out!